Larry “Kuuyux” Merculieff is of the last generation of Aleuts of the Alaskan Pribilof Islands to be fully raised in the traditional way. Kuuyux, a name given once a generation, means extension, like an arm extending from a body. Living this destiny, Larry served 35 years as a community leader on St. Paul Island, his home. His work now extends internationally, as he facilitates the use of traditional ways of dialogue, decision-making and consensus building, and talks about indigenous elder wisdom for modern times. Larry helped secure recognition of Alaska Native subsistence fishing rights, and to develop culturally- based adaptation strategies for the impact of climate change. He has co-founded several organizations and received several awards for his work. Larry Merculieff is an Indigenous messenger and teacher. Indigenous wisdom keepers throughout the western hemisphere and other parts of the world have shared their wisdom, knowledge and prophecies with him, asking him to share their words with others. Issues related to cultural and community wellness, traditional ways of living, elder wisdom, and the environment are close to his heart. He recently chaired the Indigenous knowledge sessions at the Global Summit of Indigenous Peoples on Climate Change attended by indigenous representatives from 80 nations. 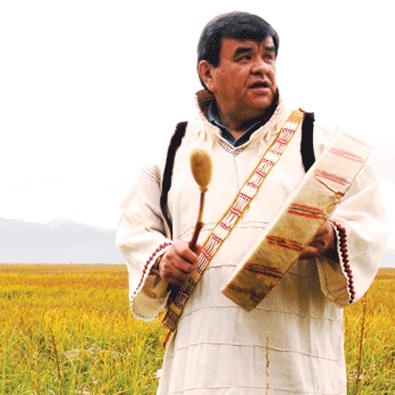 Larry Merculieff has served his people, the Unangan (Aleuts) of the Pribilof Islands and Indigenous peoples worldwide, for four decades. His writings and interviews have appeared in such publications as the Winds of Change, YES, Red Ink, Alaska Geographic, Smithsonian, National Geographic, and Kindred Spirits. Larry was featured in National Wildlife magazine as an “American Hero”, having called national and international attention to major adverse changes in the Bering Sea ecosystem. His life story was featured as one of ten Native American men in the United States who were selected for a book titled “Native American Men of Courage”, published by Second Story Press. Wisdomkeeper, One Man’s Journey to Honor the Untold Story of the Unangan People, is about the wisdom of Elders through the lens of his life, with North Atlantic Books in July of 2016. Read Larry’s article on Native Perspectives on Sustainability. Larry Merculieff speaks of growing up with traditional spiritual practice.